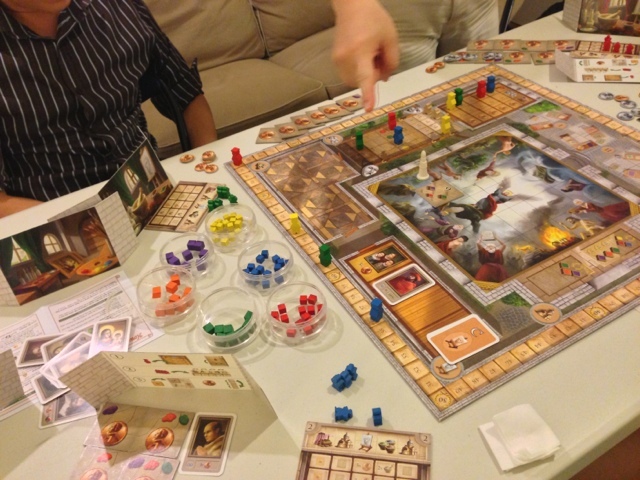 Push Your Luck Podcast: Fresco : better than pastiche ! So Jon and I have never played Fresco before. I have heard of it but somehow a copy never crossed my path that I could play it. Dion decided to correct that and brought out the game for us to play. Now I won't go into details of the mechanisms of the game because its not a new game. We played with only 1 expansion (portraits) as it was kinda late and we thought having all the expansions may make it a longer game. Its still quite fun and I bet with the other expansions it will make for a deeper game. As it is, its a light-medium worker placement game and while I had thought its light weight but I had a lot of fun. Thinking when you want to wake up will decide what paints you can buy. Wake up too late and you may lose out on the colors that you wanted. Then fulfilling a part of the fresco you want to manipulate the bishop to score extra points and if you are scoring more than once you want to position the bishop to maximize your scoring. Mixing paints is rather standard so nothing new there. Since we played with 1 expansion, thinking of which portraits to get is also quite fun. In my game I screwed up the last part because the worker placement board is flipped so you can mix 1 time before you fulfill the fresco which means I could have scored more and not come in last. Still I had fun and I would certainly like to try it with all the expansions and the new add on as well. It maybe light for some but I think if you play with the expansions it will add quite a lot of depth. Recommended! Eric / Jonathan - great website! fantastic game reviews and photo's....! Lol that's because i don't remember scores of games when I lose! Great review. Fresco is one of my favorite gateway game. I am really surprised that Eric has never tried it as I have played Fresco over 20 times... probably that's why I have never suggested it among the grp. I strongly suggest playing with the extra 2 paint colours expansion. I play it this way even as a gateway game with first time gamers. Adding the other 2 expansions simply give more options to get direct points/paints but doesn't really add more to the depth of the game. I have also tried the other 4-6 expansions that comes separately... most of them somehow increase the length of the game without adding much depth sadly, more like unnecessary distractions in my opinion. Anyway, we should try it together some time! And oh yes, its horrible for 2 players! "Eric / Jonathan - great website! fantastic game reviews and photo's....!